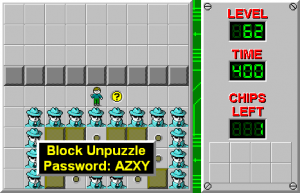 Block Unpuzzle - The Chip's Challenge Wiki - The Chip's Challenge Database that anyone can edit! At the level's start, no buttons are covered by blocks. You may want to make a map of their positions. Block Unpuzzle is the 62nd level in Chip's Challenge Level Pack 4. It was created by Andrew Menzies. As the hint suggests, start by moving one block onto each brown button. There are no spare blocks so do not position any blocks in a way they cannot be moved again. Recall that blocks cannot be pushed across thieves. Once the blocks are in position, go through the south teleport, through all the traps and push the block over the blue button. Press the green button and exit the room through the west teleport. Back in the main room, you must now do the opposite as before and uncover each brown button. 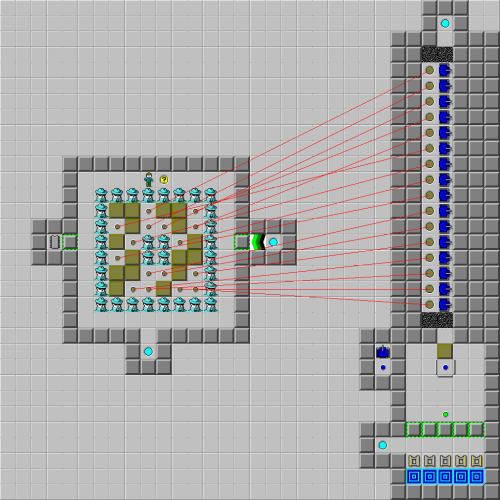 This will trap the tanks on the other side of the level allowing you to exit. Once you have uncovered all the brown buttons, go through the south teleport, head south to the bottom of the level through the socket and to the exit.